He will probably never say as much, but it is a sure bet that at some point last season, sitting in his University of Texas dorm room, James Banks III watched Tech play basketball with Ben Lammers off the floor and saw his opportunity. Sylvester Ogbonda looked uncomfortable handling the ball. Abdoulaye Gueye was a high-energy player with zero offensive finesse. So Banks, realizing the prospect of playing time was slim in Austin, headed back home to Atlanta. Now, he is arguably the Jackets’ best player. While Tech has its big man for the near future, Tech men’s basketball is in desperate need of something else: shooting threats. Brandon Alston is in his final year of eligibility, and when he is on the floor, the Jackets’ already meager capacity from deep takes a dive. Jose Alvarado is shooting under 30 percent from deep, Curtis Haywood is hot and cold and freshman Michael Devoe has yet to find his rhythm. And help does not appear to be coming via high school recruiting; the Jackets are yet to sign a single player to their Class of 2019. 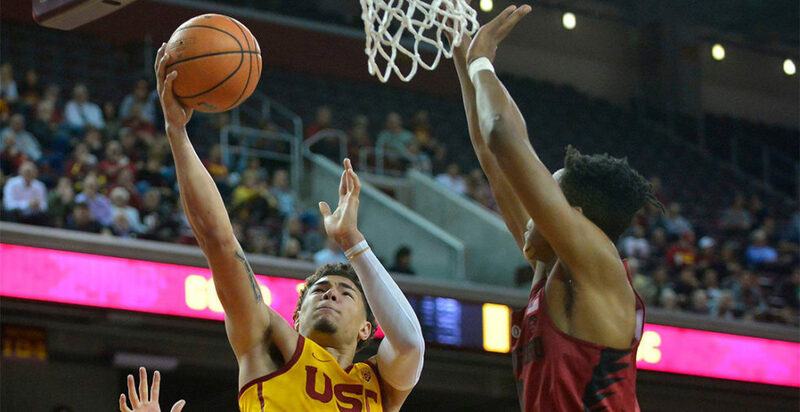 So perhaps that was why shooting guard Jordan Usher, facing an uncertain future ahead at the University of Southern California, decided to follow Banks’ path. Tech offers, if nothing else, a chance for early and frequent playing time. Usher’s situation differs from Banks’ in a couple of key ways. First, Usher leaves USC on less than ideal terms. He was suspended from the team indefinitely over a personal conduct issue; it is unclear when he would have seen the floor again in Los Angeles had he decided to stick it out. And second, Usher was not a fringe player, desperate to find playing time anywhere. He played all 36 games as a freshman, starting the team’s two National Invitation Tournament games and stepped up his production significantly early in the 2018-19 campaign; he was averaging 8.6 points per game, good for seventh on the team. While Usher was not generally in the starting lineup, he was a valuable rotational piece. For Usher though, a trip down south makes sense. Both Alston and Banks are transfer success stories, and returning to the Peach State, whose Wheeler High School Usher recently dominated, gives him a strong support system. And a college athlete who leaves Los Angeles but does not want to abandon city life can do much worse than Atlanta. If Usher can be summed up into a number, it is 40.9: his three-point percentage his freshman year, which he earned on 1.8 shots per game. That figure dropped to 28.6 percent this year, but over a sample size of only 12 games. Should he shoot at anywhere near that efficiency at McCamish Pavilion, he would by far be the best shooter the Jackets have on the floor — unless someone like Alvarado or Devoe takes a massive step forward. Usher must sit out a year from the date of transfer, but that means he will join the team next spring; in other words, the Jackets must survive the non-conference schedule without Usher’s help, but will get him when ACC play begins. For the team that takes the second-least three-point shots in ACC play, any production Usher might contribute is welcome. Usher will only be the third four-star recruit brought aboard to Tech in the Josh Pastner era; 247Sports had him ranked as the No. 12 player in the state and No. 104 player nationally in the Class of 2017. If the Jackets succeed in integrating him into the offense and Tech makes a significant step forward next year, it will be fair to wonder if the book on Pastner when he signed his contract at Tech — great recruiter, mediocre tactical coach — was wrong on both counts. But after a loss to North Carolina where the Jackets collapsed in the second half for the second game in a row, Jackets fans likely care little about how Pastner gets results: they just want change, and Usher brings hope.